I am dying from the cuteness of this launch, guys! 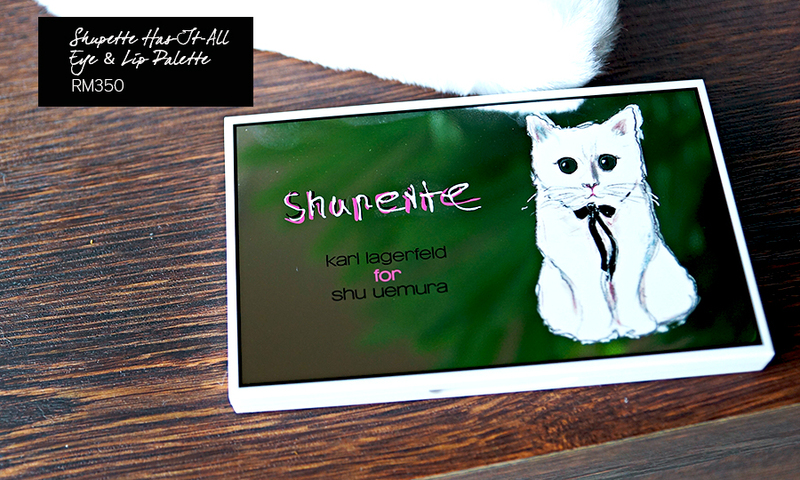 Shu Uemura has once again collaborated with Karl Lagerfeld to create a brand new Christmas collection centered around Choupette, infamous feline and Karl Lagerfeld's pet, aptly named the 'Shupette' collection. The entire collection is peppered with pawprints, illustrations of Choupette, and pretty, shimmery pink accents. I die. I wanted to share with you my two favourites from this collection, the faboo shupette has-it-all eye & lip palette, and the insanely beautiful pam-pearl me face powder. The shupette has-it-all eye & lip palette (henceforth just 'the palette') is a beautiful little thing, packaged along with a fluffy white clutch and a shimmery pink box. 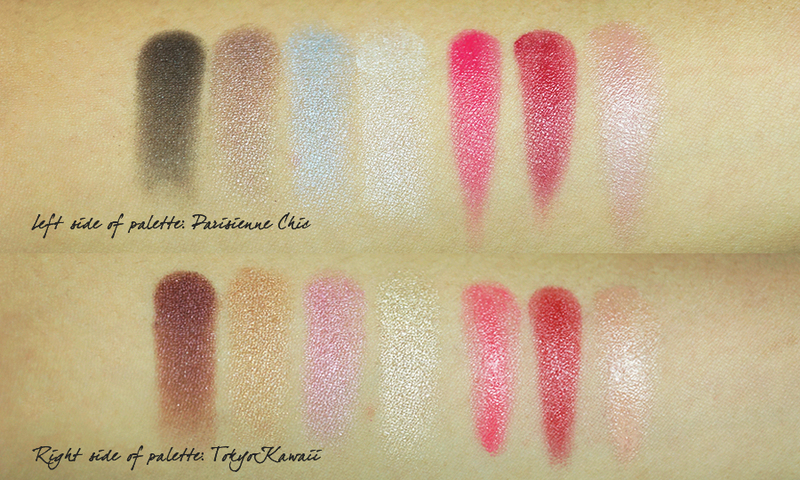 The palette has two themes - Parisienne Chic (cool silvery tones) and Tokyo Kawaii (warm golden tones). I don't think a description of the colours will do this palette justice, so here are swatches! I am a massive fan of the taupe and silver eyeshadows in the Parisienne Chic palette, and the warm plummy chocolate and golden highlight in the Tokyo Kawaii palette. Both sides are beautiful, but if you lean warm, you might want to run a warm brown/orange shade into your crease before using the Parisienne Chic side of the palette, to transition the colours into your skin. 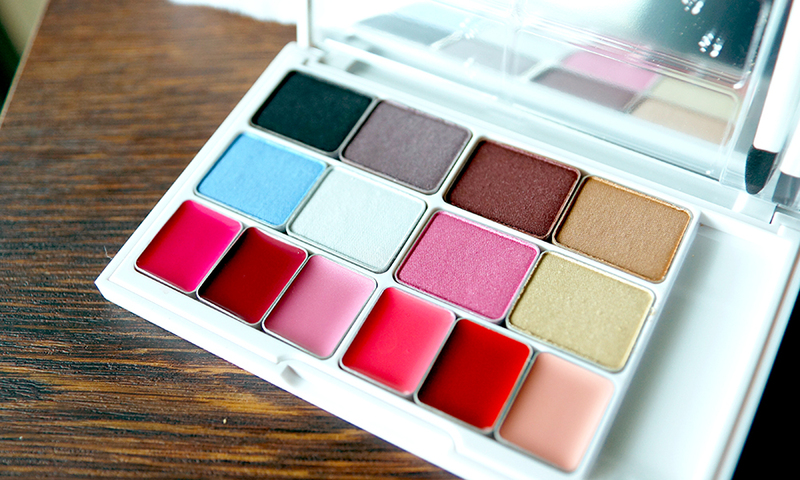 The eyeshadows are lovely, pigmented and smooth to apply - no primer needed for the swatches above! I'll be creating a look or two with the palette and uploading it to my Instagram page, so if you want to see what these look like in a full makeup look, follow me there for updates. 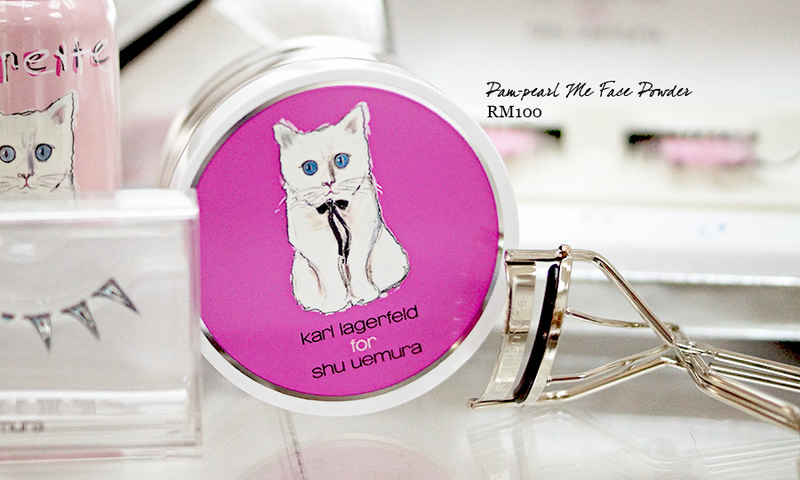 The palette retails for RM350 at Shu Uemura counters. Now the pam-pearl me face powder is just out of this world. It is a beautiful, shimmery pearlescent loose powder that I think is perfect for the holidays. It gives your skin a dewy glow that I went crazy for when I tried it at the event. Unfortunately I didn't get to take it home with me, so I don't have a proper swatch for you guys, but you can check it out on counters because it's already available in Malaysia, and retails for RM100. If you're oily-skinned, use this just as a highlighter to set the areas around your eyes and on your nose, but leave the rest to your mattifying face powder. This is the cutest collection ever, and I adore everything that's been released! Will you be getting anything from the Shupette collection?